A beach house means different things to different people. Some opt for sand and strips, others for white canvas and pine. This 15,000-square-foot East Hampton house, designed by John Barman and Jack Levy of New York's John Barman, Inc., is about exuberance, thanks to a client with a mind of her own. "She likes bright colors, as I do," Barman says, going on to explain that the client "Specifically requested a palette of blues and yellows. In the bedroom, she wanted grey. And she asked for a Chinese orientation overall, because, as she said, 'It's a serious house. I want to make it fun, but with quality furniture.'" As a result, the house is awash in color and light, from the double-height entry hall to the dining room, library, master bedroom, guest bedrooms, and children's rooms. The blue-and-yellow theme threads though the interiors, in floor coverings, drapery and upholstery fabrics, and accessories picked up on two trips to England. When barman and Levy found the vermilion lacquer chairs now sitting in the front hall, their decisive client pronounced, a la Diana Vreeland, "Red is my neutral. It comes from hanging around you." Chinese patterns and influences abound, Rooms are detailed with bamboo-patterned curtain rods in a variety of finishes; Chinese-style prints upholster wallls, sofas, and chairs; and a giant dragon sweeps across the floor in curtain rug. The library, in a departure from the dominant theme, takes its motif directly from the sea. the lighthouse-shaped octagonal room is paneled in waxed mahogany, and sports a rope-covered chandelier. This is the country, after all, and a little flexibility is in order. 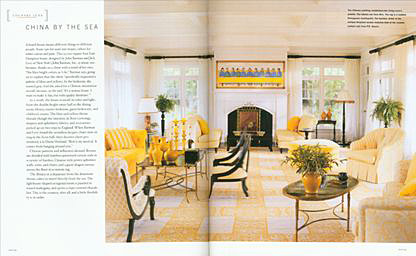 Barman and Levy used the client's love of strong color and chinoiserie to make this beach house truly exuberant. Four custom-made Chinese figurines on custom-made stands guard the enterance to the dining room and the entry hall ( left and opposite ). The red-lacquered dining room chairs are Chinese Chinese Chippendale; the table is early nineteenth-century English. The chandelier is from Richter. A custom rug from Stark dominates the double-height entry hall. The lantern is from Charles Edwards, London. barman, whose love for red is celebrated, notes his client insisted on the red hall chairs by saying, "Red's my neutral. I got it from hanging around you." The two early-nineteenth-century English wing chairs are classically upholstered in button-tufted red leather. Two antique Chinese silk banners of ancestral figures hang on high. Stark custom made the stair runner. The master bathroom has his-and-hers pedestal sinks and tiles from Waterworks. the bamboolike curtain rods are from P.E. Guerin. The curtain fabric is from Christopher Hyland. the ornamental mirror is venetian. An early-nineteeth-century English recamier offers a place for lounging. One powder room features faux-painted bamboo trellis on the walls above white beadboard. The gilt wood mirror is Chinese Chippendale. the bamboo theme includes the sink, by Sherle Wagner. In the second powder room, a yellow-painted Chinese chest from ABC carpet & Home has been topped with marble and adapted to hold the sink. The color palette and Chinese motifs are also found in the guest house. The red-lacquered faux-bamboo bedside table is custom. The bed cover and upholstery fabrics are from Clarence House. the custom rug from Stark matches the striped window fabric from Robert Allen. The faux-bamboo curtain rods from P.E. Guerin, used throughout the house, add another layer of detail.